At the end of a lovely day full of laughter and fun, there’s time for just one last game for little Bunny and Big Daddy Rabbit. All their woodland friends join in, too —woo-hoo! 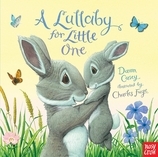 But when little Bunny gets tired of all the hullabaloo, Big Daddy Rabbit knows that a special lullaby for little one is exactly what’s needed. 20 / 8" x 8"
Dawn Casey traveled in Africa and Asia before working in a garden studio, publishing multicultural children’s books. She now dreams up her own stories, inspired by the everyday magic of the world. She lives with her husband, two little ones, and a tabby cat. Charles Fuge has been writing and illustrating since 1988. Published while he was in art school, his first picture book won the Mother Goose Award for best newcomer to children’s books. He is also the illustrator of Who Woke the Baby? by Jane Clarke. Charles Fuge lives in England with his partner, Sarah, and their son.